PocketsandBows: Happy Belated Birthday to me!!! Happy Belated Birthday to me!!! Hey guys!! I know I'm super late, but my 22nd Birthday was October 4, 2009. My friends, family and I all went to Maggiano's Italian Restaurant, Karaoke, and to club lounge. Here are a few pics from my day! You're hair is so beautiful. I realy am jealous. You look really nice I love it! Where did you get those blue shoes from? 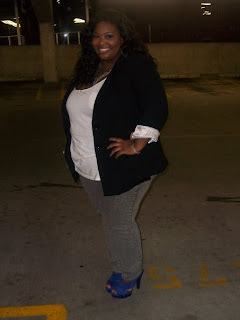 I can't really see them, but they look like those blue heels from Torrid. @Deborah-Lee Thank you so much!! I love the blazer and jean look! @Animated Ruby Thank you so much for the bfay wishes!! those blue heels are HOT! I know it's really late, but Happy B'Day ! I wish you the best !! Your outfit's awsome ! I loooooooove it ! Besides you're very beautiful ! ;D ! @SaksinthCity! AWW! You're so sweet! Thank you so much!! I love your outfits as well! And you're so pretty ! !